← 11 Years Ago Today…. The long-time followers of this blog probably will recognize some of these pieces, but since I just finished my latest art project yesterday, I thought it might be fun to lay everything I’ve done since I started art lessons out in one post to kind of get a perspective on it. If you’ve seen them before, just humor me. When I walked into Bonnie’s business for the first time, the last art lesson I took occurred about 37 years before when I was 8. 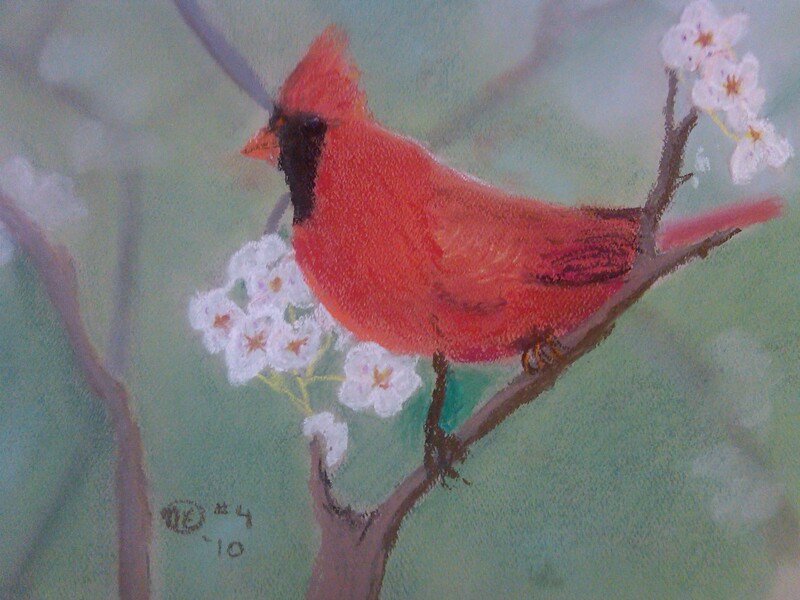 Learning to do art was one of those things on my list of things to do sometime, and I had seen her sign on the side of the road for “The Cottage Gallery,” which stated that she did framing, works on commission and art lessons. After we met and talked, we realized that we had met each other before – about 20 years before, Mark and I had rented our first house in Alabama from her father. She graciously agreed to teach me art. 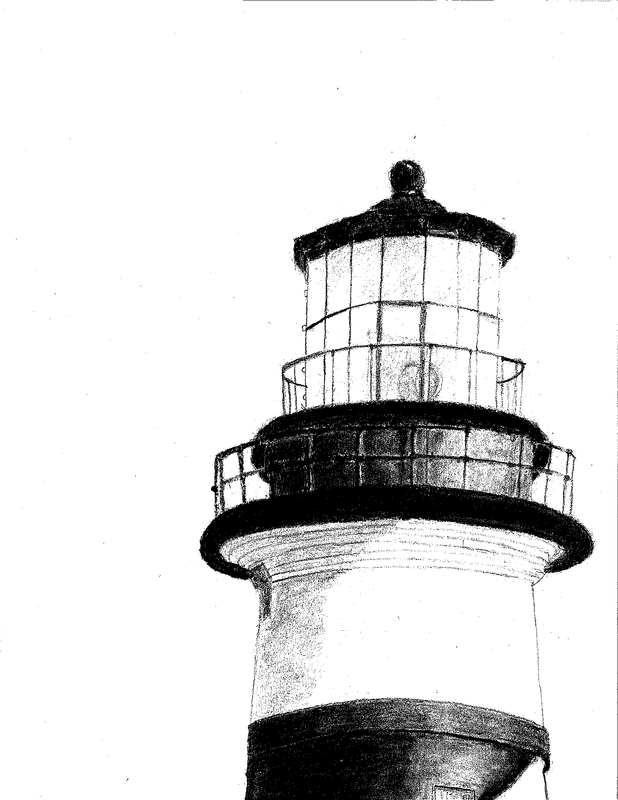 The first picture I ever tried was this drawing of a lighthouse. (Bonnie lets you pick out the subjects that interest you, only pulling you in if you try something too hard for your current skill level.) I remember how wonderful it was to learn that doing art did not mean that you had to draw a straight line without a ruler! I used a model from a magazine for that picture; the next picture that I did I designed on my own. I did not plan on the clouds being quite so dark, but it was a pastel drawing and I was working on it during Kayla’s swimming lessons. A spot of water fell on the original cloud color, and the only way around it was to darken the clouds considerably. I ended up liking the effect though. 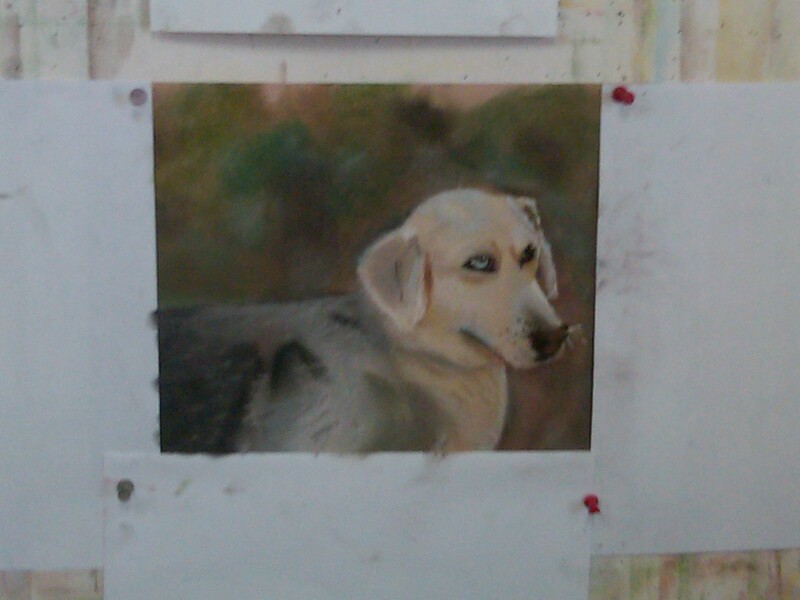 At close to the same time, I also was working on a pastel picture of Tyra when she was about three. Pastels are a chalk like substance and very forgiving to work with. This picture remains one of my favorites even after about two years of lessons now. Unfortunately, the photograph does not do the richness of the browns in this pastel portrait justice. 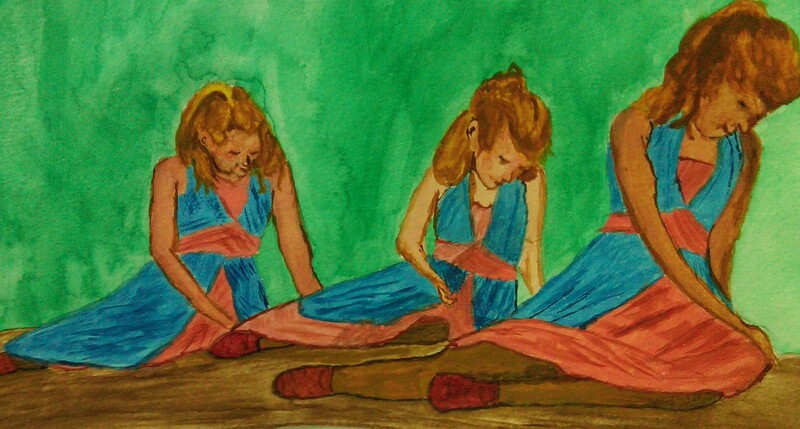 For my next drawing, I decided to try watercolor, and my first set of human figure(s). 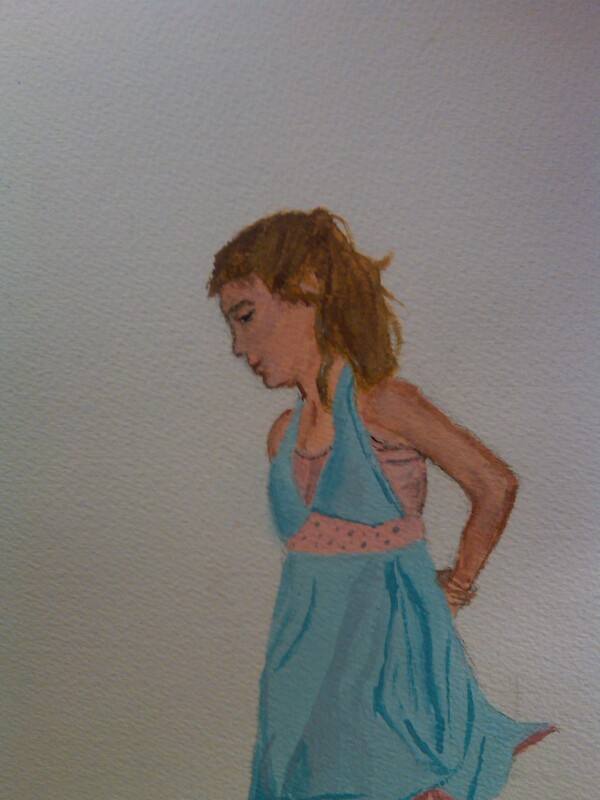 The first picture came from a photograph I had of Kayla at her 2009 recital, and to me, watercolor seemed the only appropriate medium to capture the feeling of that moment. The real portrait is not nearly this dark, but this snapshot still gives you the flavor of the painting. 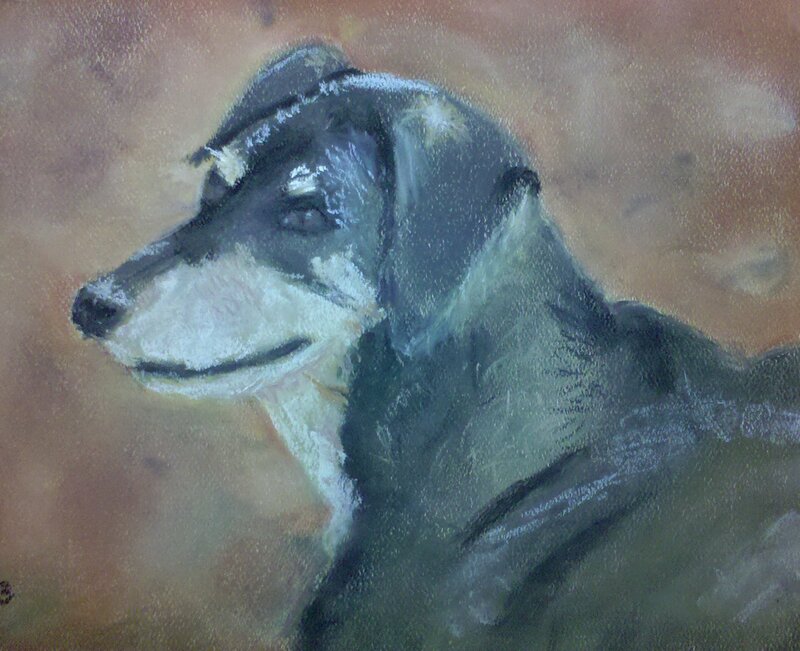 I went back to pastels to try to paint a pastel portrait of Mandy for Kayla. This painting was the best I could do, at least at the time. I may give another try sometime at getting a good portrait of Mandy. As you can imagine, Mandy’s unique husky-basset hound features present an interesting challenge in terms of perspective. 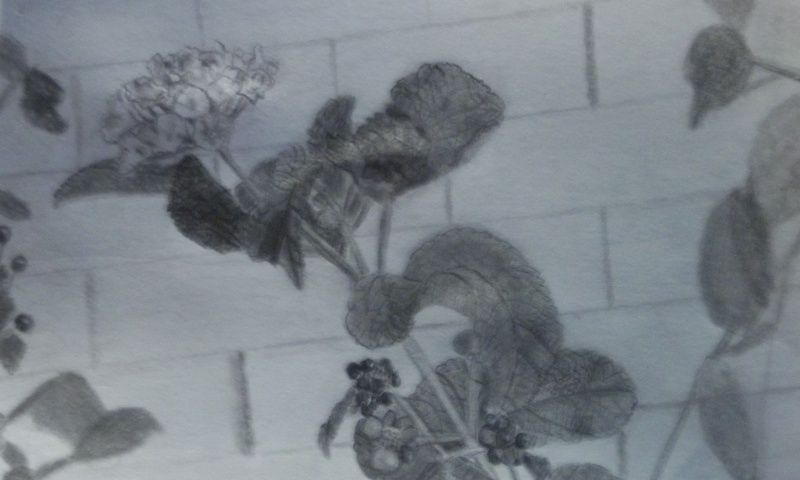 I reverted back to graphite pencil for my next challenge, a black and white rendering of a close-up of some Lantana we had growing against the white brick of the building I work in one summer. Making a black and white drawing from a color photo is a challenge; you are focused to concentrate solely on the value (the amount of light and dark) in an object rather than on both its value and color. I decided to try my hand at using acrylic paint next, and, using a magazine photograph as a model, painted this portrait of two blue birds in a mountain stream. I had a lot of fun with it. Acrylic is a fairly forgiving, albeit fast drying, medium. 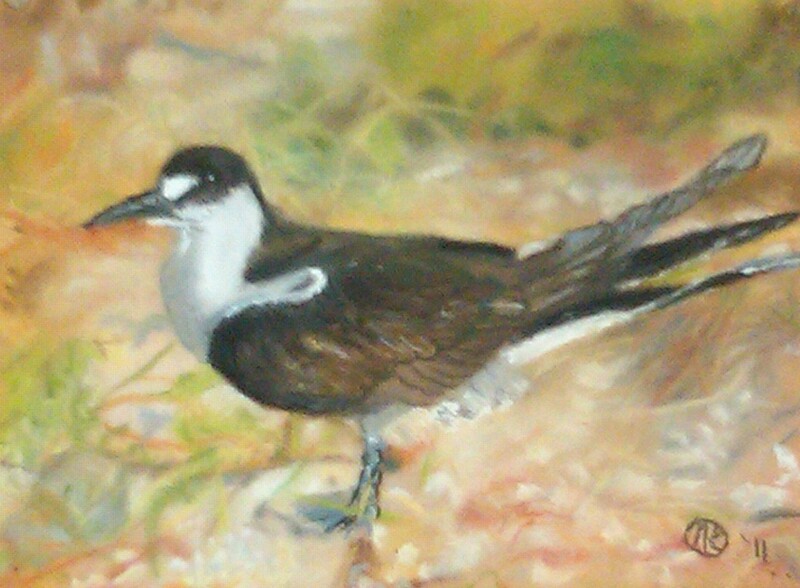 I made this pastel painting of a bird called a sooty tern next. It also is one of my favorites. 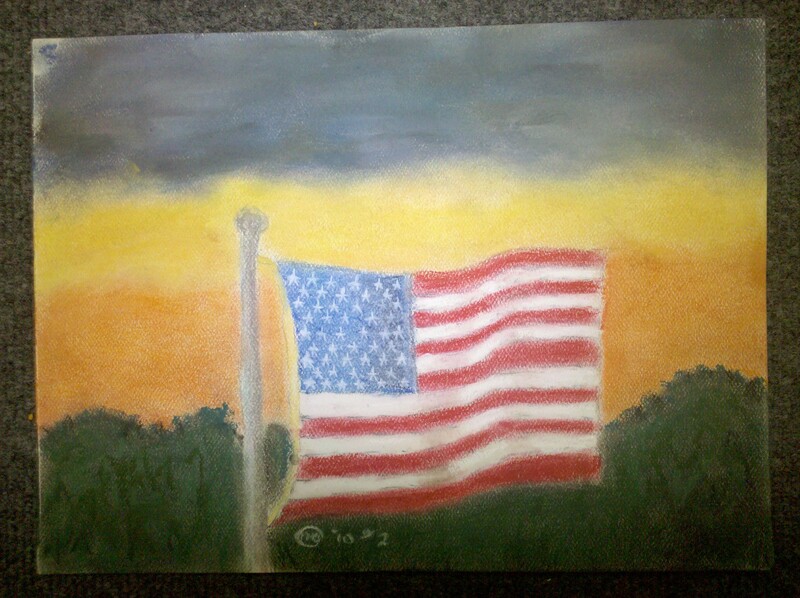 After that one, I did my first oil painting. Oil painting is very different from acrylic painting; oil paint dries very slowly and so can be put on the canvas in different ways. 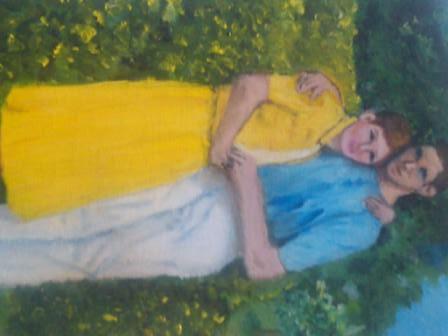 This painting was my attempt to make a color painting from a photograph of Grandma and Grandpa when they were young. I declared this picture finished at one point, but then decided it wasn’t and so went back and made some more changes. The version above is the final version. 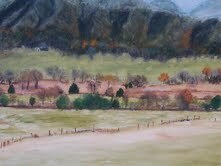 Somewhere in all of this, I also took the time to do the following watercolor from some photographs I took of Cades Cove. I am going to try out a pet theory with this one. I am going to name it “What is Man?” based on the size of the mountains and the smallness of the human additions to the valley and enter it in a few art shows. The title makes it sound like I was really trying to be profound which may give me points with judges, but you and I will know that I really just wanted to paint a pretty landscape. This picture is interesting to me because after carefully considering it for about three months, I am convinced that I am not done with it and so am going to have to go back to it. The problem is that I only see the picture I meant to paint if I turn the lights in my office out in the afternoon, then walk over and look at the picture from the left at between a 35 and 45 degree angle. So, I am going to try to get that same look on it for front and day time viewing. My final project has been the hardest to date, but it has been very, very worthwhile. I just finished it yesterday. Interestingly, it is just an intermediate step to a final project. 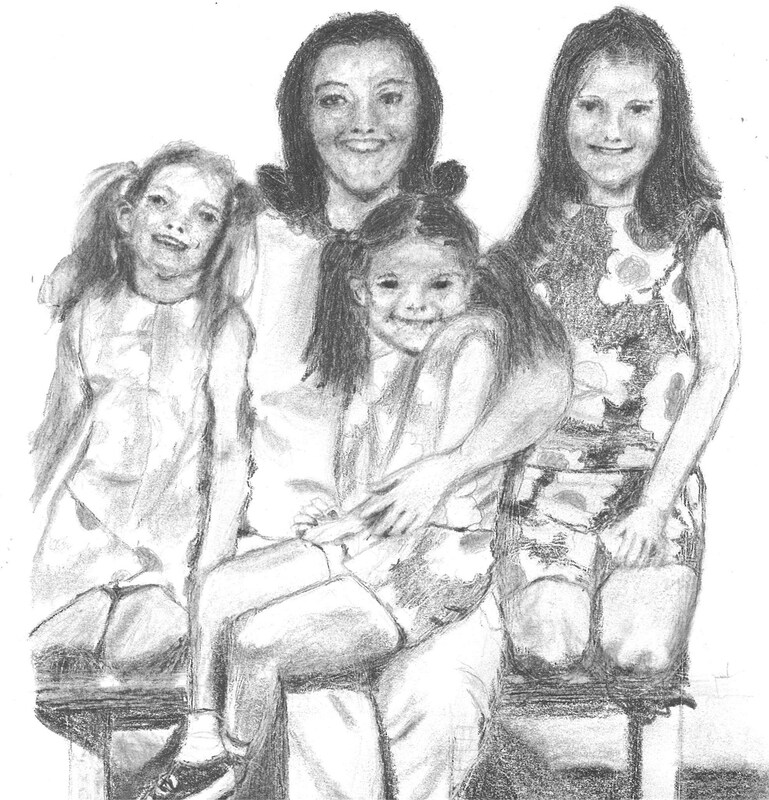 This drawing is taken from a passport photograph my mother, sisters and I had taken back in 1972. Eventually, I am going to do an oil painting of it, but I decided before I did an oil painting of it, perhaps I better try it in pencil first to get a real feel for what is involved. I’m glad I did; I learned an awful lot by doing so! Well there you have it; a retrospective of about 2 1/2 years in the life of a beginning art student! For those of you still awake by the end of this, I hope you have a good Thursday and a wonderful weekend! 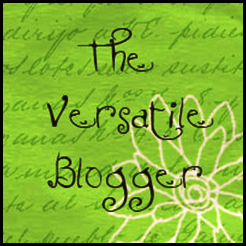 This entry was posted in working mom and tagged acrylic, art, drawings, graphite pencil, oil paints, oils, paintings, pastels, portraits, watercolor. Bookmark the permalink. Wow! I’d like to say you’ve come a long way, but your first piece is just as captivating as your latest. It must keep things interesting to change up mediums like you do. I think the sooty tern is my favorite, although I also like your abstract and can’t wait to see the series! Wow! Nancy, I wish I had a retrospective on all my students like yours! Awesome progression! I am so proud of you! Thanks Bonnie! You’re making me blush! It was great to see the progression of your art. I really enjoyed seeing your pictures Nancy. I especially like the abstract painting. Thank you! I’ve had a lot of mixed reviews on the abstract, so that is encouraging.